What you view as impossible today can be probable tomorrow. Good morning, I feel great today. I went to bed early and although I tossed and turned last night I got some good sleep in between. The quote above came to me this morning off the top of my head. I am not sure if it was just sitting in my memory or if I have truly come up with one of my own. Many times we think that it is impossible to change our eating habits or our desire to exercise or just get our exercise in. However, if we take the time and put forth the effort what was seemingly impossible yesterday can now be probable. You can make the changes in your life that are needed to be successful in your health and fitness goals. There is only one person in your way. YOU! Today will be a weighted core day for me. When I say core I mean the entire core not just the abs. You can hit these groups of muscles many ways. Some of the big heavy exercises hit them, like the squat. Let’s first the lower-back, many people have lower back problems and if we work that area maybe we can avoid having them in the future. Cable pull through and back extensions are great for the lower back. If you do not have access to cable machine you can use a dumbbell in the same fashion. Hold the dumbbell with two hands straight out in front of you. Your legs should be wider than shoulder width. Then bent at the waist keeping the rest of the back straight bend and bring the weight down between your legs. You may feel a stretch in the hamstrings as well on this one and this is a good thing. I will be doing these today as well as the back extensions. We can talk about the rest of the core another day. In the mean time you can go to my Video of Exercise page and see the rest of the core exercises there. Well it was bound to happen, my electronic scale as died. I am one of those people that weigh themselves every day. I know I know it really is not necessary but it has become part of my routine. It always kept me focused. So I will be without a good scale in the morning. This may be a good thing and I can really focus on eating healthy. Getting all my vegetables in can be a struggle sometimes and I have promised myself to make sure I get them in. I talk a lot about protein and getting enough protein in. I am pretty good at making sure that happens. It is the vegetable intake if anything I am not getting enough of. I am a huge fan of broccoli, asparagus, cauliflower, brussel sprouts, green beans and all leeks. There really no excuse not to get them in. Make sure you eat your vegetables. Now I sound like your mother LOL. Hmmmm I do not remember my dad telling me to eat my vegetables. Tip: Go to the market today and pick out your favorite fresh vegetables and prepare them the way you like them. Have them on hand and ready to go. My thought here is since no one likes to waste money and since it is a fresh vegetable you are more inclined to eat it than let it go to waste. Good Morning, How do you interpret this quote? I take it this way, along our life journey and especially during the course of making your lifestyle change you will have bumps and setbacks along the way. Even with these setbacks you are on the path to success. Stay the course and get up and you will get to your goal. Lately it seems no matter what I do I cannot get enough sleep. I wake up still tired and in need of more sleep. The challenge is I toss and turn all night. I know this is not very inspirational and I guess my hope is that by putting it in writing I will be able to get whatever is keeping me from getting the sleep I need off my mind. I just don’t know what it is. I worked shoulders yesterday, originally I was supposed to go to Albany Strength and work with a bench shirt. It did not work out that way. Again being flexible in my training program became vital. The shoulders muscles are a supportive group of muscles for the bench-press. I like to work them a day or so after my bench routines. I typically work my benching on Mondays and then later in the week I work the shoulders. 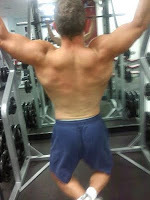 Today will be back day for me and I am hoping to be really sore on Friday. Now as far as your diet let’s remember the quote. You will make mistakes along the way and you will fall on your face. Just pick yourself back up and continue to move forward. Remember you water intake. I have been a little behind in my water intake. I promise and want you to do so as well, to increase your water intake. Tip: Keep a bottle of water with you at all times. Depending on your job you can keep bottles of water near you. Now I am not the type of guy to spend a ton of money on water. However I do keep several water bottles around me to keep filled. I fill two or three at a time and as long I have them near me I will drink them. “If they’re there you will drink them” Kevin Costner looks out. I have fallen out of the habit of tracking my foods and need to get back on track. For the most part I know what the nutritional counts on the foods I eat are. I tend to eat the same foods repeatedly. Tonight though I had Brussels Spouts and off the top of my head I do not know the dietary fiber and carb count for this food. I will start tracking again in the morning and continue to do this for a few weeks, probably right up to the Gobbler Open in November. I worked squats today and had a successful training session. I am not the beast some of the guys that lift are but I am making progress and progress is what it is all about. I need to find a way to squat twice a week to build muscle memory for the lifts. I am still experimenting with foot placement and at which point my legs are the strongest. Today it seemed I start with a slightly wider stance and by the 4 set my stance came in a bit and I felt strong. The thing I need to figure out is was it that my legs finally get warmed up at that point or am I truly stronger with a less wide stance. More work ahead of me to figure this one out my friends. As you introduce a new strength training exercise you may find you are stronger at different points of the lift. Work on those weak points and you will be stronger as a whole. Sit back as far as you can before you bend your knees. We have all heard the term “sit back” when squatting but it is especially important to start to sit back at the beginning of the squat. This will ensure that you start the lift correctly. The first motion of a good squat is pushing the hips/glutes to the rear, not bending the knees first. This will require that you have strong hips, strong hamstrings and a very strong low back. Remember that if you begin wrong, you will end wrong. If you begin correctly, you give yourself a better chance at ending correctly. Get started on the correct path at the beginning of the lift. A couple of days ago I mentioned how losing weight to fast can cause you to have loose sagging skin. I do not claim to be an expert on this but I recent ran across something called Skin Tightening. My understanding is there is a non evasive procedure called Skin Tyte. It is a skin tightening procedure that does not even need a local anesthetic, although a physician may use one on more sensitive areas of the body. I am fortunate that I do not need to look into this procedure further. However if you are so inclined feel free to check them out. I am not endorsing this just sharing information I have found. Found this quote to an thought it was an appropriate quote for us today. If you push to hard for perfection it can be daunting. Strive every day for progress and you will get closer and close to your goals and you will become the most perfect you, you can be. Let’s talk a bit about cardio and aerobic activity. Now keep in mind this in my humble opinion. Not being a huge fan of running I do know it is necessary. If not running some other intense cardio workout. Skipping rope, riding a bike, and even high reps resistance training with little breaks can be an aerobic workout. This type of exercise will really help your heart. Having the right exercise program can be a healthy way to keep in shape, as well as reduce hypertension. A regular exercise routine can get blood flowing. It will take anywhere from a month to a few months to see the actual results on the monitor. Healthy heart exercises can get the heart pumping, as well as reducing the chances of suffering from hypertension. A good exercise program can also keep weight manageable. Aerobic exercise fits into the heart healthy exercise category. It is an energetic exercise that can raise the heart rate. Aerobics can include many types of exercise. It will only help if you are consistent and do not give up. If you find it hard to stick to a routine, which many of us do try mixing it up. When you mix it up you keep it interesting. I find that the best time to do this type of exercise is before breakfast. Since you were fasting since the evening before you will get your metabolism cooking and burn more fat as that is the fuel source you have at that point. Be sure to stay hydrated. Drink a lot of water. Man there is that “W” word again. Didn’t I just rant about that? Remember our bodies were built for motion. Today I will be squatting. I am exhausted now I cannot imaging how they are going to go today. I will make sure to eat properly to fuel myself for the lifts. Start looking as food as fuel for you body and you will notice that it takes on a life of its own. You will want the proper fuel in that body to accomplish your goals. If you find it hard to stick to a routine, try parking in the furthest space and walk into work or the mall. You can also take the stairs instead of the elevators. Remember that as long as you are getting some type of exercise, you can improve your heart’s condition. Although scheduling it is better after all you schedule everything else in your life. I was reminded again today to take it slowly, that I might be overdoing it a little. 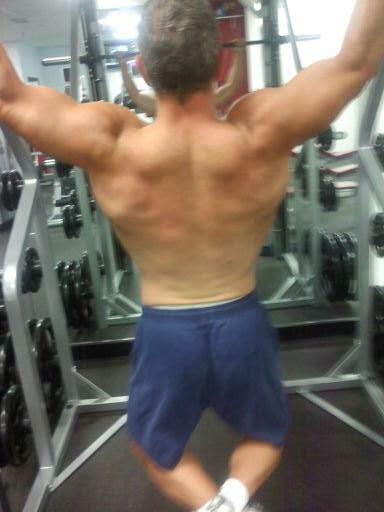 I sometimes want to train an extra day and forget that I am closing in on the 50-yr old mark. It is just that I can almost taste some of my goals right now and I so want to know I have them in my back pocket for a meet. I do not want to get to a meet and not hit a PR that I have hit in the gym. Another words I want today’s PR to be easy on meet day and maybe a new PR set that day. We will see, I just need to be patient and as Rick stated this past weekend, Trust in my workout schedule. Back to working out tomorrow. I plan on hitting the weights hard after taking the whole weekend off from them. I feel sorry for those plates. I had plenty of time to build up frustration that will need to be burned off. Have a good workout! I know I will! 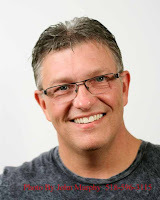 This weekend our Guest Blogger is Rick Cancelino. He finished second in the USAPL Raw powerlifting National Meet and qualified for the Arnold Sports/Fitness Festival for 2012. He is also an accomplished bodybuilder. "Believing in and trusting your training program while still listening to your body"
There are literally hundreds of different training/workout programs to reach your particular fitness and/or competitive goals. The key to success and reaching your goals are picking a training programming and committing to it. After you commit to the program two things will be needed for success, consistency and effort. Consistency is the first step in reaching your particular fitness and/or competitive goal. You should always stick to your plan to reach your goal and be consistent i.e. if your a distance runner and your plan calls for two speed days a week, then you should follow that protocol until race day. Once your showing up for your training session consistently it is important to put max effort into each session through out the duration of the program. Max effort is complete mental concentration during "heavy" and "light" training loads. Sounds easy enough right? Not so fast. You must believe that the training program is going to work to reach your particular goal. I can guarantee you will talk to and/or see someone else that has achieved great results using a different program then yours. When this happens, believe in your program. Any one that has achieved results to get from point A to point G (their goal) has been consistent and put in the effort. Don't get me wrong, you must choose a solid program to reach your goal. With that aside and assuming you have chosen a solid program i.e. FST-7 for bodybuilding, 5x5 program for power lifting, German volume training, fartlek training for distance running etc. commit to the program and believe in it. It is easy to doubt your program when others may doubt your program and tell you about it. The bottom line is that with effort and consistency you will achieve results and your goals. Various factors will also interfere with your training times and challenge your consistency in sticking with your program i.e. Work hours, family commitments, weather etc. It is important to do the best you possibly can to be as consistent as possible and be willing to adjust to get the training done. Ok, when do you break the rules of being consistent and putting in max effort during a training session? You need to learn how to listen to your body. There will be times you walk into the gym or go on the track where you feel "off". Your body's immune system might be fighting illness, you might feel pain in your shoulder, or you may feel a twinge in your hamstring etc. If this happens do not continue and wait till your 100%. Max effort when not feeling 100% will eventually result in injury. This seems like common sense, but I have seen many people get hurt by listening to their ego instead of their body and continuing to push themselves. Consistency and effort while feeling 100% will result in reaching your goals. Well there you have it even the philosphers knew what they were talking about. We begun is half done. I was reading a post from someone just the other day and they had stated that they just went through their cupboard and threw out all the foods that were not on her diet. I thought to myself there is someone who is going to be successful. She had started her journey on the right foot with a no turning back attitude. Well begun young lady you are half way their to the knew you. I thought I would talk about one of the supplements I take. Casein Protein, I like Optimum Nutrition’s Casein Protein. If you purchase it through GNC you may pay as much as $40.00 for a container. Get it through my site and save a few bucks. It has a nice flavor and whips up nicely as a pudding. That is how I eat it. You may want to add more water and have it as a shake. One of the amazing qualities of casein is its ability to make a clot or gel in the stomach. The clot is able to provide a sustained slow release of amino acids into the blood stream, sometimes lasting for several hours. Thus keeping the body in an anabolic state and provides better nitrogen retention for use by your body. Since it is a slow digesting protein I like to take it before bed. Again this keeps my body from going into a catabolic state. I have tried the vanilla, chocolate and blueberry flavors. They were all good even though the blueberry looked like gruel. LOL OK one more thing. It contains 3 carbs per serving and two of them is dietary fiber. This gives you one net carb per serving. While packing 24 grams of protein per serving. It also contains the amino acids Luecine Isoluecine and Valine, building blocks for muscle protein. It also contains arginine. Arginine is another amino acid and it is a vasulator, which helps the blood flow through the muscles. It has also been know to help control blood pressure. I worked my shoulders yesterday and they felt great. Many people will tend to neglect their shoulders. This will negatively affect your physique and you have a muscle imbalance if you do not spend some time focusing on them. There are several exercises you can do to hit the shoulders. The to main exercises are the shoulder press or military press and lateral raises. The shoulder press will build strength and size while the lateral raise tends to shape the deltoid and give it that cut up look. In reading this quote what comes to mind for me is no matter where you start, the mile is there for you to finish. Be it walking or running you need to approach that mile with all the energy you have and can muster up to complete the mile to the best of your ability. Being the complex machine your body is your time will decrease as you make it regular routine. Our bodies have the ability to increase its capacity in strength and endurance. Your endurance will increase as you continue to exercise. Your strength will increase as you push it to its limits. In regards to your strength training I want to make something clear. If your goal is just to maintain a healthy body, strength training is for you to. Just because I strength train pushing harder to achieve heavier goals does not mean you have to as well. Strength training will increase your balance, give strength to your bones and help you walk and sit with better posture. Not everyone is genetically predisposed to but on massive amounts of muscle. You may not have the Mesomorph body type. 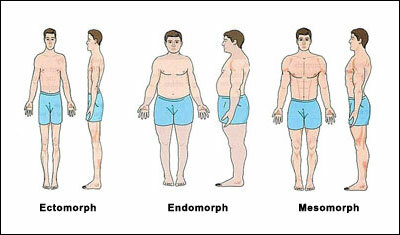 You may be an Ectomorph or Endomorph. Ectomorphs find it very hard to gain weight. They have a fast metabolism, which burns up calories very quickly. Ecto’s need a huge amount of calories in order to gain weight. Workouts should be short and intense focusing on big muscle groups. Supplements are definitely recommended. Ectomorphs should eat before bed to prevent muscle catabolism during the night. I suggest a Casein Protein. Which digest slowly. Generally, ectomorphs can lose fat very easily which makes cutting back to lean muscle easy for them. Lucky them in this respect. Then of course there are the combination body types. 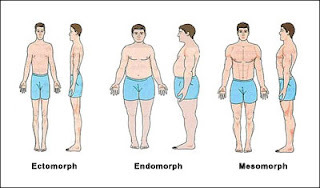 I believe I am a meso/endomorph. I know that if I do not watch my diet closely that I can put on fat easily. It seems to me that unless we are talking a lineman most athletes are mesomorphs. Tip: Look in the mirror today and figure what type or body you have and try to incorporate the correct amount of cardio for your physique. Know your body type will help you understand what is and isn’t happening in regards to muscle gains or strength gains. Where you start is not the most important part it is where you finish! I said this to someone yesterday and they said to me that is a great quote for your blog. I am not sure if I heard it someplace or it just popped into my head. Send me a comment my friends and let me know if you have heard it before. When you start your diet or as I like to say lifestyle change you need to know where you are when you start, however more importantly knowing where you are going and how you want to finish. You need to keep your eye on the prize, the pot of gold at the end of the rainbow. Not the Twinkies you left at the beginning. That is why I believe where you finish is more important. The quote applies to lifting as well. It does not matter what you have accomplished in the past or can do today, as it is history when you are done doing it. Look for the finish line and push to it. My friend, who works out with me, had never strength trained before we started 2 years ago. His bench was week and I give him credit for ignoring his start point. He has worked hard and concentrates on where he wants to be to finish. He hit a new personal record for himself last Monday. He knows it is more important where you finish than where you start. So start strength training today and keep you on that point in the far future where you want to finish. The set a new goal and shoot for that finish line. Tip: When choosing a workout partner, make sure that partner will be as dedicated or maybe a little more than you. Make sure you talk to each other and encourage each other to reach one another’s goals. You both need to be on the same page. I came across this quote today and was shocked by who had said it. We all remember Julia Child. Well anyone close to my age that is. She was the original TV cook. She had her own cooking show and had a dynamic personality. I can still here her with her British accent lighting up the TV screen. Anyway, let’s think about this quote for a moment. If we use life as our BINGE instead of food wouldn’t life in general be more exciting. For me my binge is powerlifting and bodybuilding. Find what your binge is and use it to your advantage. Wouldn’t you have more time for your binge lifestyle if you ate properly and exercised? So go a head and binge today however, binge on life not food. As I was sitting at a Boy Scout meeting last night a woman introduced herself and informed me she was a nutritionist. At first I thought here we go I will have get on my soapbox and defend how I eat and the Atkins Program. Much to my surprise and delight she was all about a lower carb and healthy fat diet. She went deep into the science of it regarding the liver and the gall bladder and the release of enzymes to burn fat. She even stated how the brain needs fats and people who eat a higher fat, lower carb diet have a lower rate of Alzheimer Disease. Well there you have it another professional who gets it and is willing to let the world know it. She may be a guest blogger on the weekend in the future so keep your eyes open. While sitting with a group of guys at the meeting last night one of the guys asked how nationals went. I was happy to tell them, they went well. I was viewing my blog at the time and one of them saw my pics on the front page. They started asking questions about how much I work out and then one of them stated something to the affect that they were getting to old to start. Well that got the ball rolling and I showed them my page “Who is Wesley (Jim) Kipp”. They could not believe my before photos. They had to ask my son if the photos they were looking at were actually me. Then I told them how old I was and that those photos were only 2 and a half years ago. They all took my blog address down and wanted to take a better look at it when they got home. I guess the bottom line here is we are never to old to make the changes we need in our life. We can create new habits and those habits can become our new lifestyle. Notice I often mention that it is a lifestyle. Exercise and Diet need to become part of your lifestyle and the changes need to start there. Tip: It takes 21 days to create a new habit. Take the time to really focus for the first 21 days of your new diet or exercise program and it will become a habit. It you remember to schedule exercise time the way you would any other meeting or activity it will become a habit to do so. The same with your eating. Write down your meals for the day and eventually when you do not have that list in front of you it will be a habit to eat in a healthy manner. Those who do not plan, plan to fail! Quote of the day: Those who do not plan, plan to fail! Unknown My quote of the day I just came up with this morning. (correction someone else did say it) Although I am sure someone else has said it at some point in time I am just not sure who, and if they have and to be frank I have not heard it. It comes to mind because this weekend I failed at planning my meals around all the activities I had going on. I ate way to many bars as replacements to meals and was hungry all day. When all is said and done I just don’t feel as well as if I had planned properly and had real food, healthy meals throughout the day. There is no and I say NO substitute for real food in the body. Many meal replacement bars and protein bars (there is a difference) have sugar alcohols or sugar substitutes or even worse in my mind SUGAR. Then when you read the labels they have soy protein and all kinds of other preservatives. Now I am not saying they do not have a place in your diet, what I am saying is they should not be meal replacement for an actual meal. This weekend I must have eaten a full box of bars just because I did not plan well. My stomach was a mess, and I just was not at 100% in the activities I attended or the work I was doing. Strength training has many benefits. This past weekend I was helping my Father in law bring in his doc and the boats lifts. This is usually is an adventure, but this year it was even more of an adventure. I wear a wet suit as we hit the fall because the water can get pretty cold after being in there for a while. Due to the 2 tropical storms that had come through northern NY the lake is pretty high. Well of course those who have met me and know me, know that I not a tall person. The water at the end of the doc was up to my neck and wearing a wet suit adds buoyancy. It was funny try to move things in the water while avoiding floating. We all know I swim like a piece of slate. Well that was the first challenge. Then it was time to bring in the 25-foot boatlift. I thought I would just take the back myself and let 2 guys take the front. My thinking was it is heavier in the front and the 2 of them should be able to handle it. I lifted the back like a military press and watched the two of them struggle to move it forward 5 feet. Not being the most patient man in these situations I suggested my 1 of the guys go to the back and I told him how to lift it. After assessing the situation I told the other guy to go in the back and help him. At this point I had decided to place the lift on my shoulders and walk out with it as if I was performing a powerlifting squat. I got under the bar and stood up and walked it out of the lake. It was not as heavy, as I would have thought it would be and the look on the 19-yr old kid’s face was priceless. My father in-law is use to me doing things that he does not think can be done. I don’t know how many times he has said, “Oh Jim, you can’t do that your going to get hurt.” I am sure he is just concerned but also surprised as well. Many times it is not a matter of being strong but a matter of technique. When you strength train and you use proper form you body gets stronger, and builds muscle memory and can accomplish amazing things. I was lifting the lift with my legs and a strong tight core. This I learned while doing squats. I wish we had video of the task. It must have been funny to watch. I started back exercising in December 2008 and have not looked back. 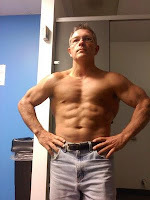 I was 46 years old and had started to grow old, with the exercise it was like the clock turned back. However, even with the exercise I was incorporating into my daily routine I was missing an element. That was a change in diet. Once I made the change in my diet the weight came right off. I ate very well and was never hungry. I controlled my carbs, protein and fats and stopped drinking alcohol. I will have a glass of bourbon every once in a while, which is not even monthly at this point. I made those changes for myself. It didn’t matter that other people were calling me fat. I had to get to the point I wanted to do something about it. ARE YOUR READY? On a more serious note I have some friends both online and around me that have battled addictions. Whether it is alcohol, or some other type of drug. The people who have beaten these addictions are the real heroes. First they recognized they had a problem, whether through an intervention or just by their own free will. Some enter a drug abuse rehab center others find other ways for help. It seems to me drug abuse rehab has to be the one of the most difficult things to go through. I do not have first hand experience in this matter but have see it tare some families apart. If you or a family member are in need please get help. One such facility is the Birmingham rehab center. Now back to working out. Did you know that working out is a healthy addiction. In this respect I am an addict as well. I look forward to my workouts 5 days a week and even sneak in a 6th day every now and then. WOW a truer statement was never made. Every success story being for weight loss, starting an exercise regimen or competing in a power lifting competition all starts with small efforts. 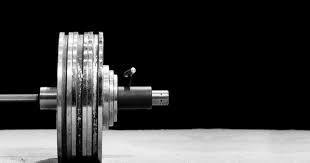 OK maybe with the powerlifting it ends up with big efforts in the gym, but it is the small efforts that get us in the gym in the first place. It is your small efforts that will help you successfully lose the weight you want to lose. Those small steps become big choices. You make those small efforts everyday. From things as simple as choosing to cook something instead of eating out of a box to the small effort you make in the store when you purchase your food. Since I brought up eating out of a box, let’s think about this for a moment. We are mammals correct? Name me another mammal besides our pets that eat out of a box. A side from when my children beg me to have an ice cream with them and I go ahead and make them happy and have it, I cannot remember the last time I ate something out of a box. Maybe, a bag like that which wild long grain rice comes in, but not a box. The small effort of buying whole fresh foods works for me. So make those small daily efforts that will make you a success. I will be putting together a new exercise routine for you again. I like to keep changing things up. 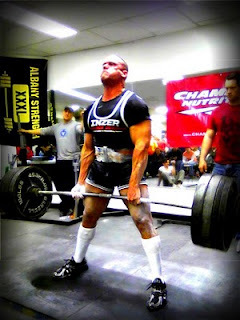 Who knows maybe I will put my powerlifting routine out here just to get comments from my friends at Albany Strength and my friend Brian in Binghamton. Heck even Dr. D said he would look at what I am doing to make sure I am not over training. I tried on a bench shirt last night; it was a new experience for me. It was very tight in the triceps and the guy told me it was not tight enough yet. To go to the worlds, if I get the offer, I will need to put on a bench shirt to compete. I prefer to compete in the raw division, but cannot pass up this opportunity if it is given. The stroke on your bench is very different when using on of these shirts. Also you really have to pull down on the bar to get the weight to your chest. I will work with the shirt for a month or so and continue with my raw training on weekends. I have a new goal in mind for my raw bench and hope to hit it in November. As you start your exercise regimen, like me starting with the shirt remember to concentrate on form. Watch the videos of the exercises I have posted for you to make sure you are doing them correctly. Form is so important in the beginning to build muscle memory. As you build muscle memory the motion becomes second nature to your body. The actual motion will get easier and you will be less likely to get an injury, which could sideline you and make starting over extremely difficult. Tip: Think about what you can add to your diet, not what you should take away. When you think about what you can add as a healthy replacement to the foods that sabotage your efforts. You will be more likely to enjoy eating, and enjoy you new lifestyle. As I sit here my mind is blank. I think I have writer’s block. So let me see what I can come up with. As many of you know I competed at the USAPL Nationals. This may have qualified me for the IPF Worlds in South Africa. The challenge there is to be competitive I would need to put on a Bench Shirt. 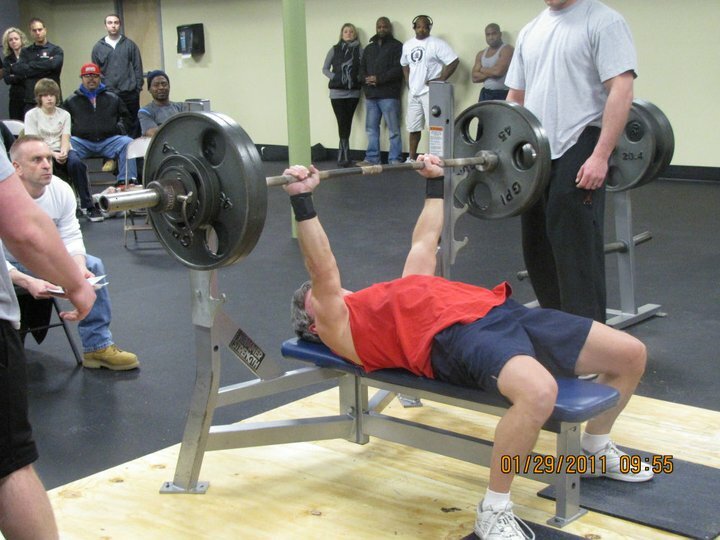 A Bench Shirt will increase the amount you can bench press. They are very tight on the body and give a little spring when you press the weight up. I am going to try a shirt for kicks today. I am not going to stop lifting Raw, I still prefer lifting unequipped. The 100% Raw motto is “Where lifters compete, not technology.” I like that type of lifting. I still have the carrot dangling in front of me and will continue to work on my arch and push to new levels. I have a meet in November and then my first USAPL full power meet in December. My first 100% Raw competition full power meet will be in March. Those are the dates I have set at this time. Many people consider strength training to be only for athletes. What they need to realize are we live in different times. Years ago children walked to school, adults were splitting wood and carrying it in to the fireplace or wood stove. Buildings did not have the elevators and escalators hey have today. Stairs were used very often. Recreational time was spent engaged in playing ball, climbing trees, running, jumping, and hide-n-seek, instead of parked in front of a video terminal playing video and computer games. At the same time in the United States food has gotten less expensive and instead of taking care of the garden and eating what we sow, be just go buy it and it is full of sodium and high fructose corn syrup. The Food and Drub administration preaches a diet, which is high in carbohydrates and low in fats. Obviously this is not working as we as a nation are at our heaviest. Our bodies are amazing machines that have the ability to alter themselves in response to loads placed upon them in such a way that future; similar loads will be less stressful. Likewise, they can and will adapt to having no loads or exercise placed upon them, becoming increasingly weaker. Many years ago when a lot of time was spent engaged in physically demanding activities, peoples' muscular systems were stimulated daily and consistently. So going out of the way to engage in strength training was generally unnecessary. Today however, unless you have a physically demanding job where you are lifting and straining most of the day your body need some level of strength conditioning. You may need to give up some of that leisure time modern day technology has given you to pull that body back into shape. HMM I guess I broke my writer’s block! A friend of mine sent me this quote. I really think this is very appropriate. I was 46 when I started working out again and at that point in time I just set goals to get healthier and fit. When I reached the fitness level I originally wanted, I set another goal. As I get older I keep resetting my goals and dreaming new dreams. I did something yesterday I thought I would take me a lot longer to do. It was a goal I had set last January and really didn’t think I would hit it till next year. I am not ready to post about it yet but hopefully will be revealing it in November so stay tuned. As I was getting closer to my goal I kept shortening the time frame to reach that goal. Everyday I evaluate my goals and dreams and try to figure what is the best way to hit those goals. No matter what your age do not stop setting your goals and striving to make your dreams come true. Everyday can be an adventure in dream weaving and goal seeking. I read a post today where someone said that they were getting tired of their breakfast routine. This was because they were restricting themselves to what society has dictated as breakfast foods. My advice to anyone who feels they are in a rut is to think outside of societal guidelines in regards to food. There is no reason a chicken breast or a piece of steak cannot be a breakfast food, maybe some asparagus or even sautéed broccoli can be added to your omelet to spice it up a bit. Broaden you mind and think outside of the box my friends. Experiment with your breakfast and make is something special. Remember eat like a king at breakfast, a nobleman at lunch and a pauper at dinner. A proper breakfast can really kick start your metabolism and give you a great start to the day. Benching went well yesterday and I am looking forward to squats today. I will be concentrating on my form and focusing on leading with me backside and forcing me knees out as I force the weights up. For those of you that are just starting out or following on of my exercise programs I set up for you please be careful and do not use to heavy a weight that forces you to use poor form. This will cause you to get hurt and you may be out of commission for some time and this can affect your future motivation. 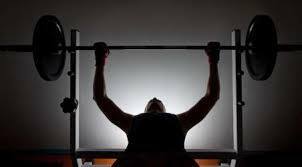 Many people bite off more than they can chew when they first start working out again. When this happens they get hurt or experience DOMS longer than expected and then decide to not lift again because the pain they experienced is just too much for them. I don’t want this to happen to you so please start slow and as you progress increase the amount of weight and reps as appropriate. I was checking the stats on my blog the other day and I noticed that I was getting some traffic from Australia. It amazes me the people’s lives that I get to impact with my blog. So I got to thinking since the people that visit my blog from there may have difficulty ordering from my site maybe I can suggest a company to them so I looked around and found Vibrant Vitality. Vibrant Vitality is a Melbourne-based Australian company dedicated to providing you with top quality, natural products which enhance your health and vitality. You will find that these are carefully chosen certified organic, vegan or raw products containing the best natural ingredients on the market. I like this company because it carries Organic Products as well as Protein Bars and Probiotics. As many of you are aware I eat a very clean diet and to accomplish this I do supplement to meet my dietary needs. When you work out as much as I do Protein Bars become a staple in my diet. Now while I am not a vegan I do think it is important to provide options for them as well. Vibrant Vitality seems to be able to do just that. OK I did not post yesterday out of respect for those who perished September 11, 2001. At that point in my life I was working at a company that had offices in WTC1. I still have my badges from the building and the Port Authority. I knew 3 of the 6 people that worked for that company that died that day, Angela Scheinberg, Ed Beyea and Abe Zelmanowitz. Abe and Ed were programmers and Angela was one of the people I reported to. I was working out of the Albany, NY office and frequently traveled down to NYC for a major project I was working on. That particular week another co-worker and I chose to go to a training class just outside of Boston in Lexington. This class is also held in NYC down on Wall Street. If we had gone to the NYC class we may have been in WTC1 that day before heading to the training location. It was only by chance that my friend and I went to Boston instead of NYC. Like many stories you hear, it was by the grace of God we were not there. This also means 2 more people were able to escape with their lives. I remember sitting at the class in Lexington when a worker in the building came in the class. They asked if there was anyone from NY in the room. Mike and I said we were. They took us to a room with a television and we watched in horror. WTC2 was already down and then we watched WTC1 go down. We just stared at each other and said we have to go. We left the training class, went to the hotel and checked out and drove home to Albany. It was the longest drive I have ever experienced. I will never forget that day and I will never understand how this can happen in a civilized world. God bless us all, no matter what religion you are or are not! Today being Monday I will be benching. Sunday night I was a little concerned because my triceps were still sore and I wasn’t sure if the DOMS would be gone by morning. I had hit them pretty hard on Friday. Tomorrow I will warm up and go for a one-rep max and then drop the weight to my new opening weight. Then I will do a reverse pyramid workout. Hitting a weight I can do for a set of 5. I will continue to do the sets of 5 with that weight until I can no longer get three reps out. Then drop the weight 10 pounds and see how many reps I get out then. If I cannot get 5 then drop it another 5 pounds. It is time to confuse these old muscles of mine. I was doing a standard 5 sets of 5 with increasing the weigh pressed on each set. It is important to change up your exercise routine to confuse your muscles. This will stimulate growth and increase strength. It will also strengthen you bones and tendons as well. Sometimes all it takes to confuse the muscle is increasing the amount of weight you use just a little. This will also help in keeping your metabolism cranked and burning calories and fat. Tip: Don't do the same workout over and over. Your body only changes when you force it to, and it's remarkably quick to adapt to new stimuli. The best way to avoid plateaus is to change your training routine every now and then, that's also the best way to avoid overtraining.